Polymer nanocomposites are polymer matrices reinforced with nano-scale fillers. This new class of composite materials has shown improved mechanical and physical properties. The latter include enhanced optical, electrical and dielectric properties. 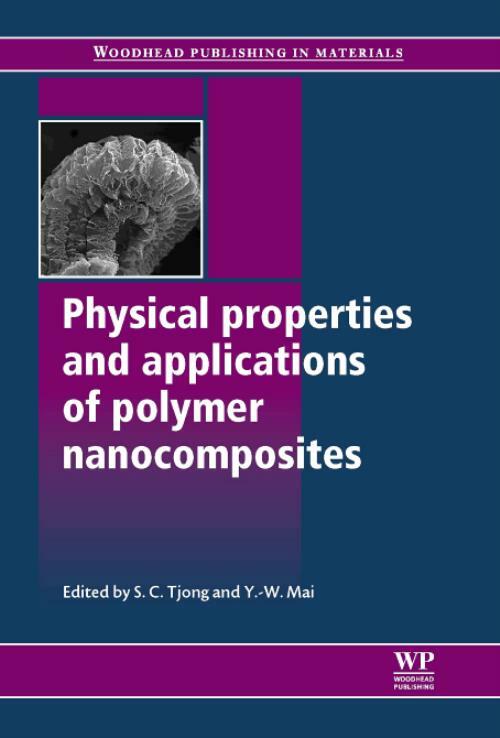 This important book begins by examining the characteristics of the main types of polymer nanocomposites, then reviews their diverse applications. Part one focuses on polymer/nanoparticle composites, their synthesis, optical properties and electrical conductivity. Part two describes the electrical, dielectric and thermal behaviour of polymer/nanoplatelet composites, whilst polymer/nanotube composites are the subject of Part three. The processing and industrial applications of these nanocomposite materials are discussed in Part four, including uses in fuel cells, bioimaging and sensors as well as the manufacture and applications of electrospun polymer nanocomposite fibers, nanostructured transition metal oxides, clay nanofiller/epoxy nanocomposites, hybrid epoxy-silica-rubber nanocomposites and other rubber-based nanocomposites. Polymer nanocomposites: Physical properties and applications is a valuable reference tool for both the research community and industry professionals wanting to learn about the these materials and their applications in such areas as fuel cell, sensor and biomedical technology. Part 1 Polymer/nanoparticle composites: Synthesis and optical properties of cadmium sulfide/polymer nanocomposite particles; Conductivity and dielectric characterization of polymer nanocomposites; Electrical behavior of particle-filled polymer nanocomposites; Optical properties of ferroelectric nanocrystal/polymer composites; Transparent and light emitting zinc oxide/epoxy nanocomposites; Polyaniline-based nanocomposites: Preparation, properties and applications. Part 2 Polymer/nanoplatelet composites: Dielectric relaxation in polymer-clay nanocomposites; Crystallization behavior of semicrystalline polymer-clay nanocomposites; Synthesis and electrical conducting behavior of graphite nanoplatelet polymer nanocomposites; Flame retardancy of polymer-clay nanocomposites; Polymer nanocomposites reinforced with carbonaceous nanofillers and their piezoresistive behaviour; Modeling permeability behavior of polymer nanocomposites; Environmental stability and flammability of polyolefin/layered silicate nanocomposites. Part 3 Polymer/nanotube composites: Electrical and dielectric behavior of carbon nanotube-filled polymer composites; Morphology and thermal behavior of polymer/carbon nanotube composites; Polymer/carbon nanotube composites for electromagnetic interference reduction. Part 4 Applications: Electrical, mechanical and thermal properties of high performance polymer nanocomposite bipolar plates for fuel cells; Electrospun polymer nanocomposite fibers: Fabrication and physical properties; Polymeric/inorganic nanocomposites: Fabrication and applications in multiple bioimaging; Gas sensing conductive polymer nanocomposites filled with carbon black nanoparticles; Nano-structured transition metal oxides and their applications in composites; Physical properties and applications of clay nanofiller/epoxy nanocomposites; Fracture behavior of hybrid epoxy-silica-rubber nanocomposites; Physical properties of rubber-based nanocomposites; Carbon nanotube nanocomposites for biomedical actuators; Nonlinear current-voltage characteristics in polymer nanocomposites. Tjong, S CDr Sie Chin Tjong is Professor of Physics and Materials at the City University of Hong Kong. Dr Yu-Wing Mai is Professor of Mechanical Engineering and Director of the Centre for Advanced Materials Technology at the University of Sydney, Australia. Mai, Y.-W.Dr Yiu-Wing Mai is Professor of Mechanical Engineering and Director of the Centre for Advanced Materials Technology at the University of Sydney, Australia.